I needed to track some time spent on coding and went to look for a fitting tool. Automatic tracking sounded a little too fragile – easy to detect app used, but what about specific tab in NetBeans or page in Opera? So I decided to go for something manual, but convenient enough. Klok is simple app that allows to track time spent on projects. as well as to edit and create entries directly. 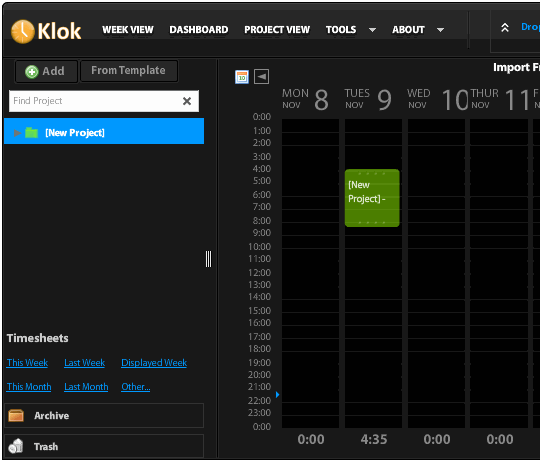 Klok runs on Adobe Air platform and is single-window app that is essentially calendar week view with color-coded areas that mark time spent on projects. Entries can be tracked in real time (by selecting what project you are currently working on) or assigned and edited manually. Projects can have sub-projects, time estimates and rate per hour assigned to them. Week overview works well and is very visual. It is easy to estimate time from blocks, but there is also precise start/stop list of entries in project properties and timesheets that summarize and calculate cost by project. App is not portable (Air apps by definition aren’t), but you can choose where to store data. Major case of “Air has own opinion how interfaces should work and fails miserably”. It had been ages since app failed so often with things I feel are total no-brainer. Want to display more than week? Mid-week to mid-week? Nope. Scroll is just crazy. Plain scrolling with mouse wheel not only affects which hours are displayed, but scales how many are displayed. Want to just fix it on hours you work at? Nope. Double click on tray ion to show app? Nope. Only activates it in taskbar, where you have to click once more to bring it up. Free version nags on startup about upgrading to paid, which has several extras related to import/export functionality and integration for teams and third party services. I feel like developers had perfectly nailed core function and then proceeded to mess with it so you are annoyed enough to pay up. It works conveniently, but you quickly learn to not touch anything so interface doesn’t perform some another feat of weirdness and frustration. Timetag.it is a web app and it integrates into Google Calendar: there’s no start/stop button, but you can name your project (start with #) and activities (start with @) related to, assign hour rate and estimated time consumption, than print reports. With my Android HTC Hero I appreciate working with this tool and advice you to give it a try. Thanks for suggestion! Bookmarked to check out. I probably need to get more acquainted with Google Calendar first, never used it much.